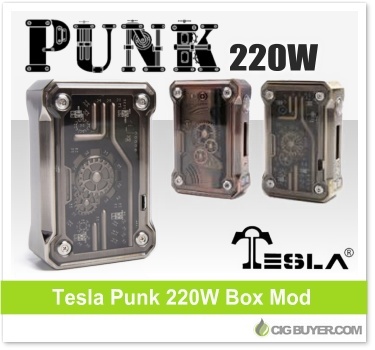 Over the past few years there have been a handful of steampunk-inspired devices, but we have to say that the Tesla Punk 220W Box Mod is the best looking one so far! This isn’t Tesla’s first attempt, but the new Tesla Punk Mod has an awesomely unique design featuring clear ABS side panels that showcase the decorative steampunk internals. It even has built-in LED lights to accent and customize the device. The Punk Box Mod is powered by dual 18650 batteries, providing up to 220W of output with full temperature control (Ni/Ti/SS/TCR) and four pre-set “Taste Modes”. It features a side-mounted OLED screen, oversized firing button and 3-button control interface with bottom battery access door.